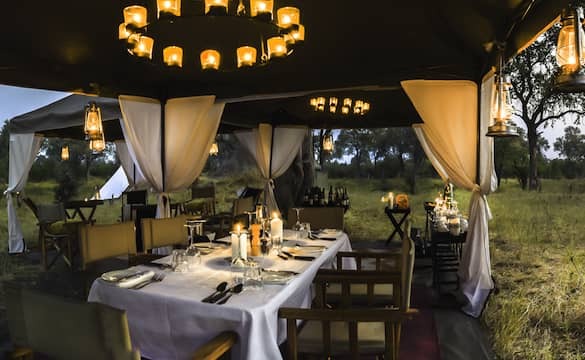 A luxury tented mobile safari in Khwai gives you the experience of the African bush like the explorers of bygone days. The focus is blending into the environment with the camp geared towards an eco-friendly use of the natural environment. Wildlife sightings are excellent with the wildlife being more comfortable around the smaller scale of a mobile tented camp. The spacious and romantic bell tents (5m diameter) have comfortable double or twin beds, with real duvets, pillows and mattresses. Each tent is furnished with carpets on the floor, hanging canvas shelves and bedside tables with small solar lanterns. In winter, there is a small gas heater for chilly mornings. All tents have an en suite bathroom with a copper basin, flushing toilet and a large bucket shower, filled each morning with warm water. In front of the tent is a seligna wooden deck, with two comfortable safari-style chairs. A copper basin in front of the tent is filled in the early morning with warm water so you can refresh yourself before the early morning game drive. The camp consists of a cosy lounge with lounge chairs, coffee table, a selection of magazines and books as well as games. The fully stocked bar includes premium spirits and a extensive wine list. Breakfast, lunch and dinner are served in the beautiful dinner tent. The menu is French-Italian inspired, prepared by our talented head chef. High tea is served in the afternoon as well, either on a game drive or in camp. The camp is staffed by a specially trained mobile tea: a head chef, assistant, housekeeper, waiter and your personal guide. "Thank you for this extraordinary adventure that you have made possible for us to experience. I will always remember this." "We thank you from the bottom of our hearts for this magical stay, out of this world." "The landscapes, wildlife, sounds are all magical and so well orchestrated by the team and the attention you have to welcome your guests." 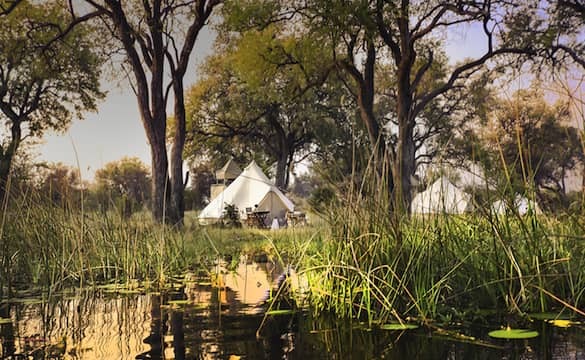 The camp is located in a private setting in the Khwai concession, on the river bank where hippos and elephants come to drink and bathe. Twice daily game drives explore the Khwai concession and sometimes Chobe, with sightings of lion, leopard, hyena, elephants and more. Mokoro tours along the river channels are organised for each guests, with a picnic lunch en route. 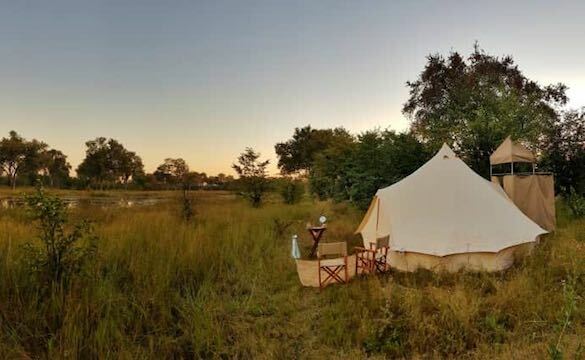 The mobile camp can be accessed either by our air conditioned 4x4 vehicles from Maun or by a small plane and helicopter to Khwai Airstrip, a 15 minute drive from camp.